Before there were televisions and computer games, kids played outdoors, often scrounging materials to make homemade toys for street games. 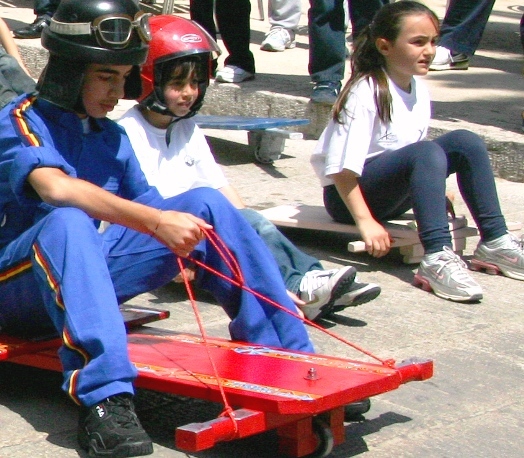 The post war years in Italy were lean times, so the Italian culture of street games was widespread, with the favorite item being a carretto – a rudimentary go-kart. Last Sunday, May 23, a celebration of Italian street games took place in Ragusa Ibla, where wooden tops, marbles, and games made from bicycle rims were played in the streets, but the focus was on what is locally known as u calacipitu, a rough and ready hand-built go-kart. A special jury award was given for the calacipitu that was made from completely found materials- wheels from the bearings of an old truck and bits of a wooden ironing board – while being decorated with a couple of horseshoes for good luck. After the judging, trophy awards and group photos in front of the church were dispensed with, the event culminated in a calacipitu parade through the town. There were a surprising number of grown men in the parade, apparently embracing the idea that you can stay immature indefinitely. Little of the danger of Emanuele’s youth was present, as many kids wore helmets, but of course, this is while their parents were watching. But to Emanuele’s great satisfaction the calacipiti all made plenty of noise. In fact, the rest of the morning in town, heads would turn and grannies would jump when they heard a calacipitu coming their way. And the whole town trembled. One thing I notice about the kids in Sicily is that they are a lot more energetic and playful than kids in other parts of the world. I can see them taking up the carretto. I’ve never seen that though in my travels to Sicily. 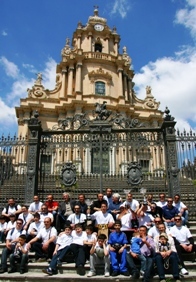 Although I’ve never made it down to Ragusa, I’ve just been through it. Hi Larry – Interesting comment about Sicilian kids and their energy level – maybe it’s all that great ricotta in their diets!